The difference between the World Class Set-up and a factory set-up is attention to detail. Frets: The frets are super-glued in place, levelled for height, recrowned and buffed. 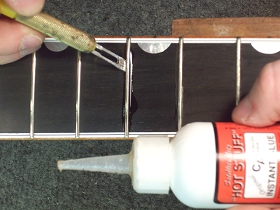 Super-gluing the frets in place will strongly discourage fret movement and fret buzz due to uneven frets. It will fill gaps between the fret and the fret-slot and to some degree will improve sustain and tone. Neck: Neck relief (a curve in the neck that compensates for string vibration) is set and measured to an accuracy of 0.001"
Nut: The string slot height is set, the string slots are smoothed out, and lubricated with a graphite compound. Action: The strings are adjusted to follow the same curve as the fingerboard and the space between the strings and the fretboard is set based on neck condition, string gauge, tuning and playing style. Intonation: STGuitarworks uses the Peterson 490 Strobe Tuner which delivers the most accurate and reliable intonation and tuning available in the industry. Pick-ups: The height of the magnetic Pick-ups is set based on output levels, balance, string action and playing style. An acoustic saddle slot is leveled flat as is the bottom of the saddle to ensure balanced output from an undersaddle pick-up.